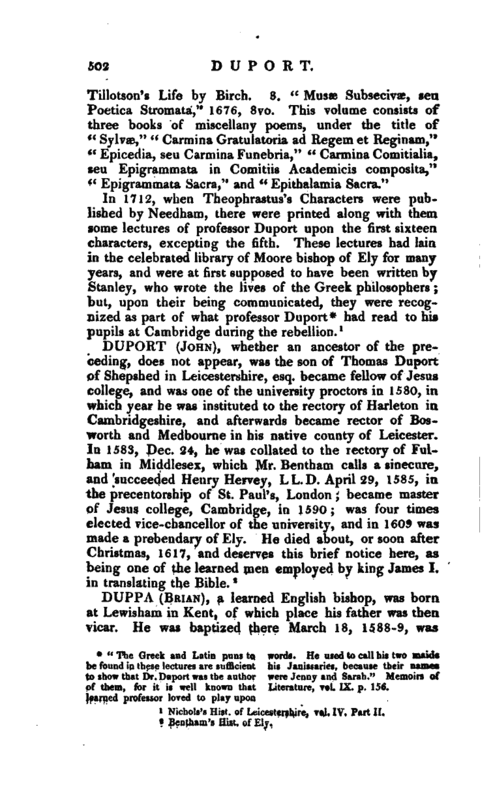 , D. D. a learned Greek scholar, was born in 1606, in Jesus college, Cambridge, of which college his father was master from 1590 to 1617; and, after a classical education at Westminster, was admitted in 1622, of Trinity college in that university, under the tuition of Dr. Robert Hitch, afterwards dean of York, to whom | he gratefully addressed a Latin poem in his “Sylvse,” where he calls him “tutorem suurn colendissimum.” He regularly became a fellow of his college; and his knowledge of Greek was so extensive, that he was appointed regius professor of that language at Cambridge in 1632-.‘ He was collated to the prebend of Langford Ecclesia, in the cathedral of Lincoln, Aug. 14, 1641; and to the archdeaconry of Stow in that diocese, Sept. 13 of that year, being then B. D.; and on the 13th of November in the same year exchanged his prebend for that of Leighton Buzzard in the same cathedral; but in 1656 he was ejected from his professorship at Cambridge, for refusing the engagement. On the 20th of May, 1660, on the eve of the restoration, he preached a sermon at St. Paul’s cathedral; and his loyalty on that occasion was rewarded by an appointment to the office of chaplain in ordinary to Charles II. 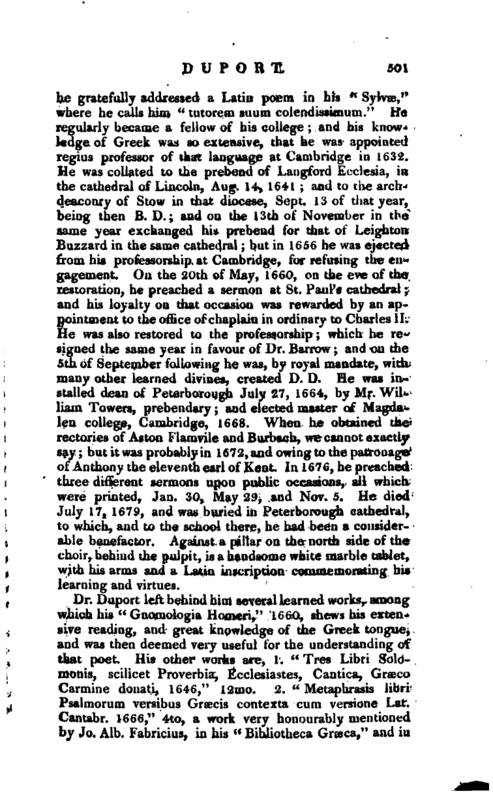 He was also restored to the professorship; which he resigned the same year in favour of Dr. Barrow; and on the 5th of September following he was, by royal mandate, with many other learned divines, created D. D. He was installed dean of Peterborough July 27, 1664, by Mr. William Towers, prebendary; and elected master of Magdalen college, Cambridge, 1668. When he obtained the rectories of Aston Flamvile and Burbach, we cannot exactly say; but it was probably in 1672, and owing to the patronage of Anthony the eleventh earl of Kent. In 167G, he preached three different sermons upon public occasions, all which were printed, Jan. 30, May 29, and Nov. 5. He died July 17, 1679, and was buried in Peterborough cathedral, to which, and to the school there, he had been a considerable benefactor. Against a pillar on the north side of the choir, behind the pulpit, is a handsome white marble tablet, with his arms and a Latin inscription commemorating his learning and virtues. 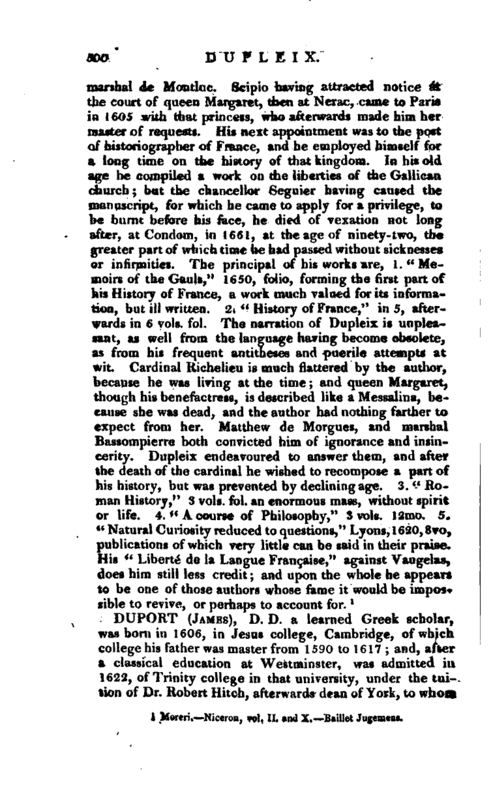 Nichols’s Hist, of Leicestershire, vol. IV. Part II.